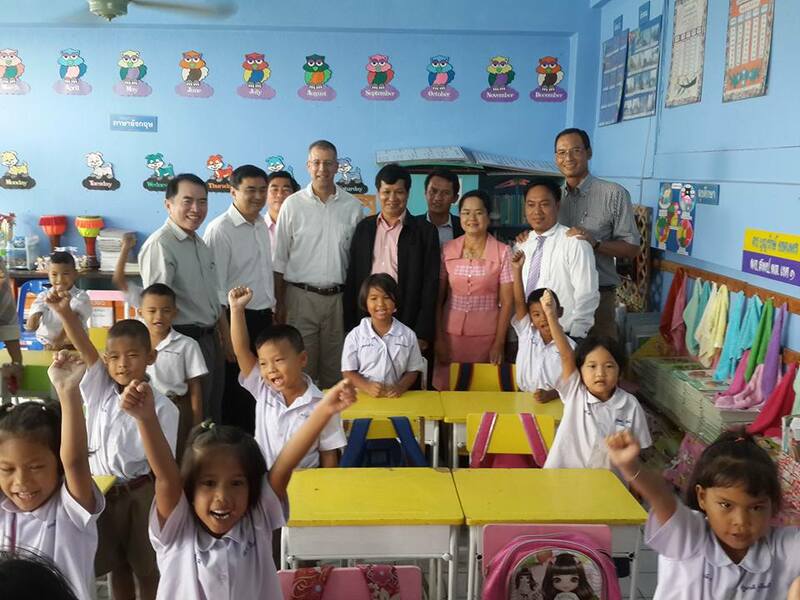 His Excellency Simon Roded, Ambassador of the State of Israel to Thailand; former Prime Minister Abhisit Vejjajiva; former Finance Minister Korn Chatikavanij; former MPs of the Democrat Party; Mayors of Aranyik and Bung Pra sub-district in Phitsanulok; and the Deputy Director and his associates at Phitsanulok Primary Education Service Area Office 1, came to visit Sapanteesam School and the project “English for all” yesterday August 4, 2015. I was tasked to host the event and gave a short overview of the project to the visitors. The most interesting part of my presentation was when Mr. Abhisit and his collegues nodded upon hearing the increase of the number of enrollees this year – stopping the “curse” the drop of numbers the school normally experience every year. The school is starting to become a beacon of hope to poor students who wish to learn English without paying a tuition. In fact some parents pulled out their kids studying in a much established schools and have them enrolled at Sapanteesam; a school who was once a nobody last year but is now a somebody this year. After the program, we visited the classrooms and watched the teachers and students execute the very purpose of the “English for all” project. The teachers were very active and knew exactly how to manage their own respective class. The students on the other hand showed enthusiasm and confidence. After observing, praises and compliments both from local and national government as well as from the Israeli Embassy in Bangkok flooded our project. The Vice Mayor of Aranyik, a sub-district in Phitsanulok showed me her thumbs up and said, “the project is excellent.” A member of the Israeli delegation offered is hand and congratulated me for a job well done. Former Prime Minister Abhisit Vejjijva also congratulated me. And the former Finance Minister Korn Chatikavanij himself, tapped my back many times and lightly massaged my shoulders. If I remembered correctly and understood him perfectly well (too many people were there so some words were inaudible), Khun Korn said that they thought of me while they were on the way to Phitsanulok – the guy who is helping their party initiate the project and their countrymen to acquire English as a second language. We’ll do something for you. Will let you know. Hearing it from one of the most popular figure in today’s politics in Thailand was surreal! To sum it up, the event was successful. The leaders of the Democrat Party were so proud of the achievements this project continues to receive. The support from people in office is starting to pile up. Lastly, everybody left the school with a smile. Here’s the video as a proof. It was aired live yesterday August 4, 2015 in Blue Sky Channel. It’s a long video but you can drag the cursor at the 24:00 time for the coverage of the teaching demonstration of Teacher Goodwill and the K2.1 students. 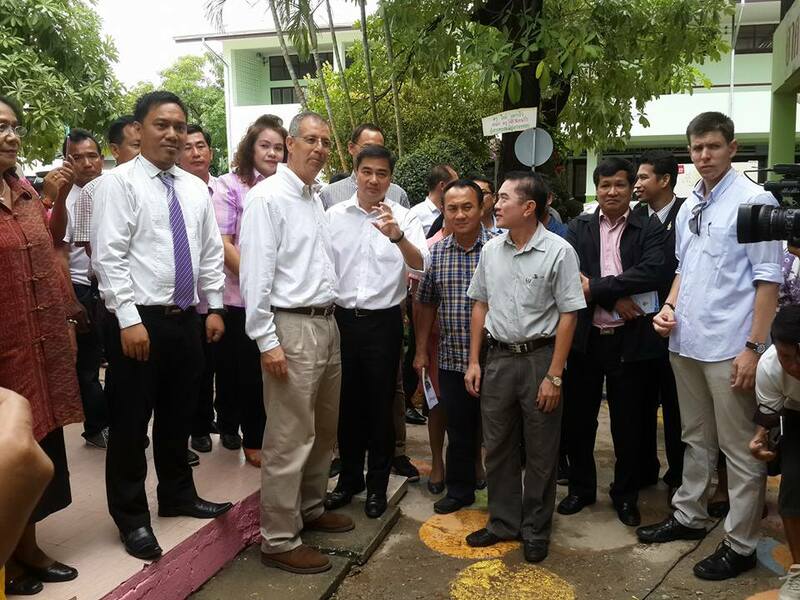 PS: There will about 100 teachers and local government officers from Kanchanaburi who will visit the project on August 14, 2015. This is another job that needs to be done. But I am absolutely up for it!